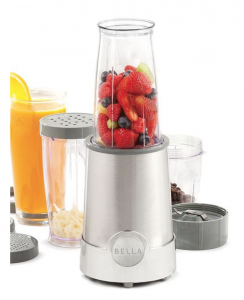 Head over to Macy’s during their One Day Sale, where you can get the Bella Rocket Blender 12-Piece Set for just $25.00! (regularly $44.99) However, this item is eligible for a mail-in-rebate of $15. Making the final price just $10.00! You can create nutritious smoothies, creamy sauces and spicy salsas, while the grinding blade will swirl away homemade nut spreads, grind coffee beans, spices and seeds for savory seasonings. Head over here to print off the rebate. Be sure to follow the instructions exactly, and in 4-6 week you will get your check in the mail. Plus, it will qualify for free shipping! Woo Hoo!